After some delays Lokkilok presents some of the Finnish participants in the Nordics. First is Esa Alaraudanjoki whom we got on the phone just before he leaves for Piedrahita. Having lived and worked in places like CH, UK, Nepal, and now Lapland, Esa is surely the most international oriented pilot in the Finnish team. And as he has been the Finnish alternate delegate to FAI meetings for some years and a couple years back been the national coordinator of paragliding competitions in Finland he also is probably best known abroad. Esa was one of the five enthusiastic organisers of the Nordics in 2004 in Laragne. He's first contact with paragliding was in France 1994 in Clermont-Ferrand. He got interested in competitions while helping out at the Nordics in Kössen 1999, and saw the second week of the rainy Worlds in Bamberg and Neukirchen. take off before launching. Among the Finns he is known as "Iso Esa" ( iso means large). 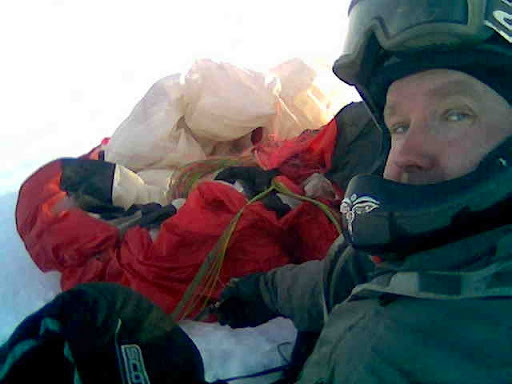 Gear: "UP Trango2, Vamp, Iguana helmet, Aircotec XC-trainer, Crispi boots, Supair reserve"
Most memorable flight: "Landing in goal first time in the Porterville competition in 2004." Personal goal: "Take off and land in goal before you ;-D. And to break one day my personal record of 59 km, which I've flown three times already."